February 1969: he makes his first appearance on stage at the Kabukiza, receiving the name of de Ichikawa Koyone II and playing the role of Rokudaikimi in the "Sushiya" act of the play "Yoshitsune Senbon Zakura". April 1979: historic revival at the Meijiza of Tsuruya Nanboku IV long-forgotten play "Haji Momiji Ase no Kaomise" (commonly called "Date no Jûyaku"); Koyone plays the role of Princess Miyagata [casting]. July 1980: revival at the Kabukiza of the never-performed 5th act of "Yoshitsune Senbon Zakura"; Koyone plays the role of Kataoka Hachirô Kiyoshige [more details]. March 1981: revival at the National Theatre of Kawatake Mokuami's drama "Jitsugetsusei Kyôwa Seidan"; Koyone plays the role of the bonze Sainen [casting]. July 1981: revival at the Kabukiza of Tsuruya Nanboku IV's drama "Hitori Tabi Gojûsan Tsugi"; Koyone plays the role of the koshimoto Wakana [casting]. April 1987: Koyone takes part in the revival at the Meijiza of the play "Jûni Hitoe Komachi Zakura", which includes the famous Tokiwazu-based dance-drama "Tsumoru Koi Yuki no seki no To" [more details]. December 1990: Ichikawa Koyone II takes the name of Ichikawa Monnosuke VIII at the Kabukiza, playing the role of Minamoto no Yoshitsune in the "Shi-no-Kiri" scene of the classic "Yoshitsune Senbon Zakura". 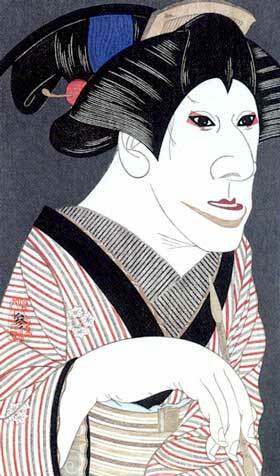 October 2003: revival at the National Theatre with the Omodakaya guild of Nagawa Kamesuke I's drama "Hade Kurabe Ise Monogatari"; Monnosuke plays the roles of Ariwara no Narihira and Isonokami Mameshirô [casting]. January 2008: revival at the Shinbashi Enbujô of "Narukami Fudô Kitayama Zakura", which celebrates the 1070th anniversary of the Narita-san Temple, where the Deity Fudô Myôô is worshipped; Monnosuke plays the role of Fujiwara no Mototsune [casting]. June 2012: Monnosuke performs at the Shinbashi Enbujô in "Ogurusu no Chôbê", "Kawatsura Hôgen Yakata" and "Yamato Takeru", in a special program which celebrates the shûmei of both Ichikawa En'ô II and Ichikawa Ennosuke IV, the hatsubutai of both Ichikawa Chûsha IX and Ichikawa Danko V and commemorates the 49th anniversary (50th memorial service) of late Ichikawa En'ô I and Ichikawa Danshirô III. March 2017: Kabuki performances in the People's Republic of China in Beijing from the 18th to the 20th of March 2017 at the Beijing Tianqiao Performing Arts Center in the heart of the Tianqiao District; Monnosuke played the role of Minamoto no Yoshitsune in "Torii Mae" [more details]. Ichikawa Monnosuke VIII is a dynamic and talented member of the young actors troupe led by the star Ichikawa Ennosuke III. Ichikawa Monnosuke VIII's best roles: Shizuka Gozen ("Yoshitsune Senbon Zakura") and Hayase Iori ("Tengajaya").